I hiked this last and final section of the Desert Trail in about 5 1/2 days. 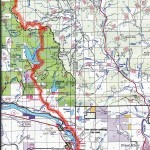 It is perhaps 95 miles from Newport, Washington to the northern terminus of the Desert Trail about 1 mile east of where Canada, Washington and Idaho come together. Use caution walking along the road heading out of Newport. After Bead Lake and before the Grassy Top trail the route follows trail, logging roads, and has some cross-country travel. Once past Bead Lake I saw (in July) only a handful of vehicles. There are many outstanding views along this route. The view from Kalispell Rock is one of the highlights. Check out the old fallen cabin there and how the lookout listed the years he was there, for decades. Make sure you fill up with water just east of the route on the 308 road just North off Kalispell Rock. There is a challenging ~5 miles section of cross-country just north of that point with little or no water. I found enough water sources elsewhere along this stretch of the Desert Trail. Whitetail, mule deer, elk, grouse and bear are common on the area, including some grizzlies. Here is a post I wrote that explains why you should respect, but don’t need to fear, bears. The last 25 miles or so of the route is the most scenic and wild. There are great views in good weather, and a long walk along the Grassy Top trail in the Salmo-Priest Wilderness. For someone out for a shorter hike, starting at the Harvey Creek trailhead and hiking north would be one of the nicest stretches. The finish of the Desert Trail is at a high point on a narrow cleared swath of trees stretching east and west into the distance. The obelisk marking the U.S./Canada border and the end of the Trail is one of the most spectacular places on the whole Trail. You can read my journal entries of this segment starting here. This Desert Trail in Washington is plotted on Google Maps below. 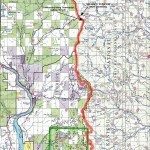 Below you will also find maps that you can view online or print. If you hike this segment of the Desert Trail, please report your experience below, including water sources, routefinding etc. 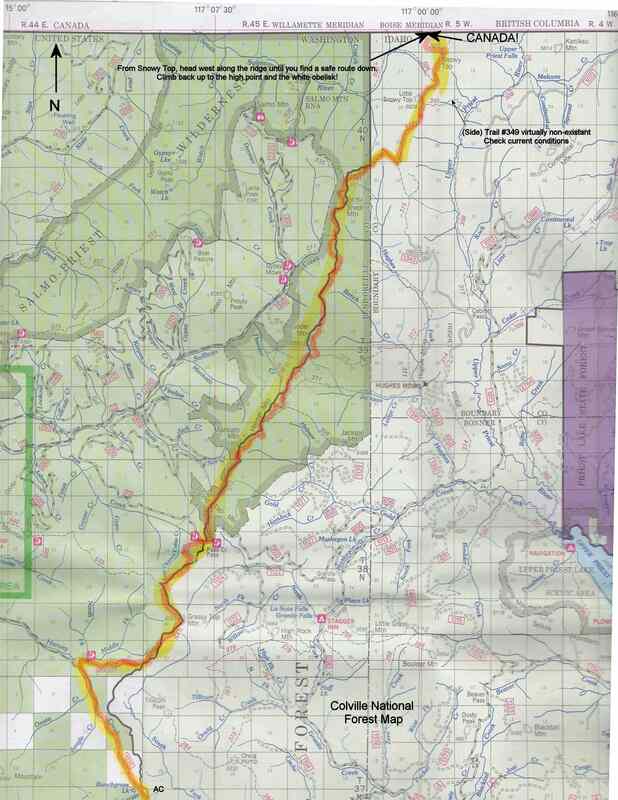 I have information on each of the new Desert Trail segments from Highway 78 in Oregon to Canada as seen below. 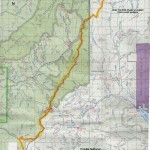 For a rough digital map of that stretch of trail, click here. View Desert Trail: Washington State in a larger map where can download the .kml file if you want and convert it for use with most GPS units. Desert Trail: Drinkwater Pass to Austin Jct.